This Hutton handmade multi coloured leaded stained glass outdoor wall lantern is rated IP43 and features a downward facing circular lantern, with vertical panels in red, yellow, blue, green and clear leaded glass that will cast the most wonderful hue of transfixing light by night. A wonderful lantern, with shaped iron work wall mount and scrolled detail. Hand crafted in Britain, with every piece of glass soldered together in the traditional way. Now you can create a welcoming glow outside your home with this wonderful stained glass leaded exterior wall lantern. Exterior fittings must have an IP (Ingress Protection) rating which indicates the fittings ability to prevent solids and liquids penetrating the enclosure. The higher the number, the greater the protection. The minimum rating for an outside light exposed to the weather is IP23. This outdoor light is rated IP43. 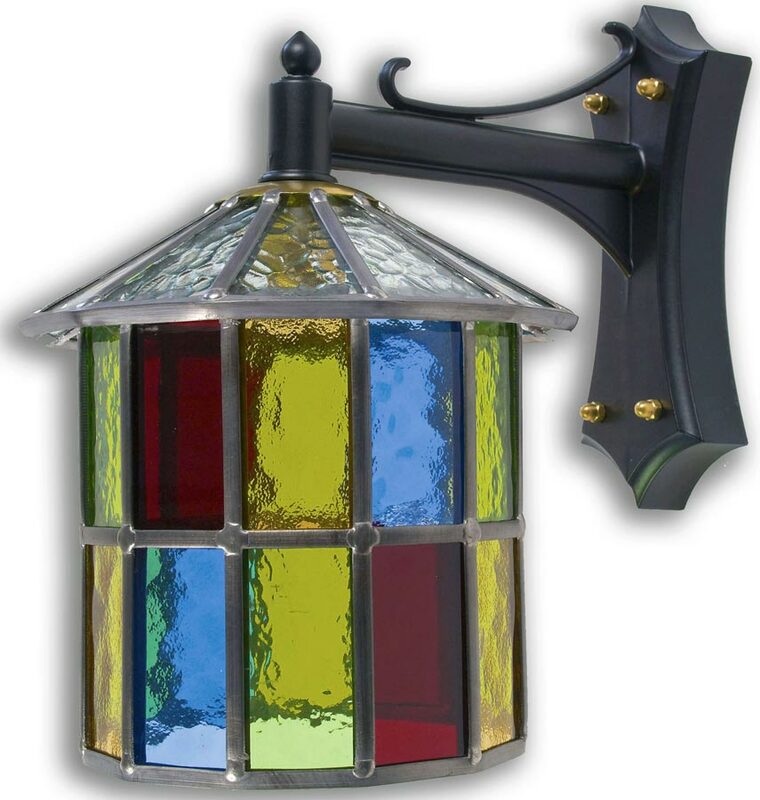 Hand crafted in Yorkshire and featuring traditional soldering techniques, this Hutton handmade multi coloured leaded stained glass outdoor wall lantern embodies over seventy-years of skilled local craftsmanship.